The quest for the best burger in NYC is an ongoing debate among many foodie bloggers. When I discovered Korzo Haus, a tiny restaurant on my block featuring fried burgers, I couldn’t resist trying this out-of-the-ordinary cheeseburger. 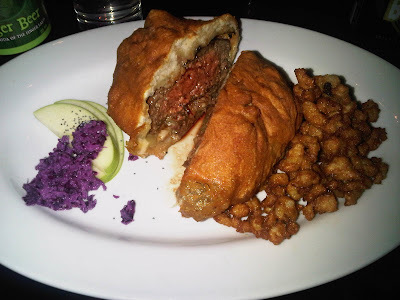 The Original, a beef patty ground on their counter, with apple-smoked organic bacon, Allgauer Emmentaller cheese, mustard, and dill pickle inside Langos Hungarian fried bread ($11) is served with Fried Halušky in rosemary oil and buttermilk aioli. Huge and not for the faint-of-heart, this burger will satisfy your red meat craving. The Langos is crispy on the outside yet soft on the inside. The bun to beef ratio and complete patty enclosure guarantees no loss of the juices. Make sure to order this medium rare to enjoy the full flavor of the fresh beef. The fried halušky is as addictive as your favorite French fries. You will be shoving them into your mouth by the handfuls. If you’re a mac-n-cheese fanatic make sure to try the Halušky w/ bryndza (Slovak feta cheese), crispy bacon bits and chives ($5). This creamy side dish is one of the best takes on macaroni and cheese that I have ever tasted. Share it with your friends, so you’ll save room for the heavy burgers. When a traditional burger just won’t do, visit Korzo Haus for this fried meaty indulgence. Korzo Haus. 178 E. 7th St. I need this in my belly immediately.